These sketches were first printed in the Weekly Scotsman, and strongly excited the attention of the Public. So many suggestions to publish them in book form were made to me, that I now do so in the hope that their publication may be of some little use to those who are striving to solve the great problem of the age. Edinburgh slums—One-roomed dwellings—Filth and wretched furnishings—No chance for morality—A cheerless existence. The deserving poor—Starving respectability—Two days without food — Appalling destitution—Chronic suffering—Dismal subterraneous regions. Slum children “damned, not born into the world”— A birth in a one-roomed dwelling--Infant mortality— A slum child’s object lessons in life—Neglect and cruelty —Driven to the streets. A step lower in the social scale—Exorbitant rents— Rapacity of landlords—The people who live in furnished lodgings—The thriftless and shiftless—Interview with a pavement artist. internal arrangements—No privacy in tho married quarters—Driven down by drink—The Model Lodging-house—A Sunday afternoon in the kitchen—Saturday night scenes in a lodging-house. How people become tramps—Two kinds of tramps— “Working” and “non-working” tramps—Interviews with tramps—Descriptions of their mode of life — Scenes in the Edinburgh Night Asylum — Tramps’ “beats” in Scotland—Winter Refuges. Wandering women—A typical case — Haunts of the sleepers-out—An utterly destitute family—Refuges of boys and girls — An odd experience — A methylated spirit drinker—An outcast. 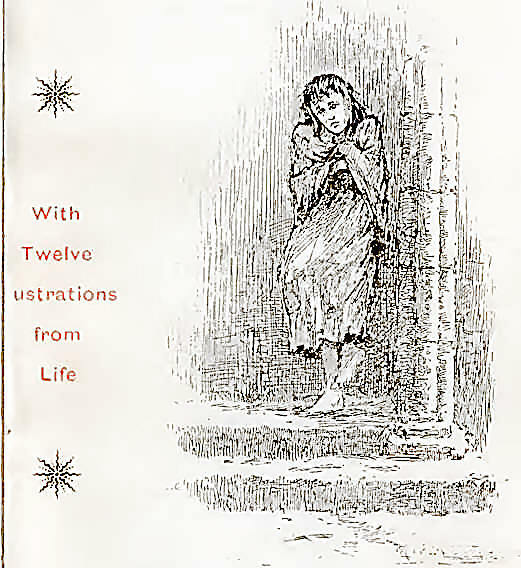 A classification of slummites—A general survey—A poor man’s asylum: an optimist’s picture—Edinburgh charities on paper—Guerilla warfare in the slums—The first step towards a remedy.